[SOLVED] How to get useful error messages in PHP? I find programming in PHP quite frustrating. Quite often I will try and run the script and just get a blank screen back. No error message, just empty screen. The cause might have been a simple syntax error (wrong bracket, missing semicolon), or a failed function call, or something else entirely. It is very difficult to figure out what went wrong. I end up commenting out code, entering "echo" statements everywhere, etc. trying to narrow down the problem. But there surely must be a better way, right?. So, is there a way to get PHP to produce useful error message like Java does? Can anyone recommend good PHP debugging tips, tools and techniques? In addition to all the wonderful answers here, I'd like to throw in a special mention for the MySQLi and PDO libraries. The best option is to configure the libraries to throw exceptions. This is best placed before you use new mysqli() or mysqli_connect(). To persist this and make it confortale, you can edit your php.ini file. It is usually stored in /etc/php.ini or /etc/php/php.ini, but more local php.ini's may overwrite it, depending on your hosting provider's setup guidelines. Check a phpinfo() file for Loaded Configuration File at the top, to be sure which one gets loaded last. Search for display_errors in that file. There should be only 3 instances, of which 2 are commented. Tracy takes care about proper setting of all display errors and error reporting options to provide output in such situations as described in original post... So this tool is especially helpful for addressing asker "Can anyone recommend good PHP debugging tips, tools and techniques?". The “ERRORS” are the most useful things for the developers to know their mistakes and resolved them to make the system working perfect. PHP provides some of better ways to know the developers why and where their piece of code is getting the errors, so by knowing those errors developers can make their code better in many ways. Another way to use debugger tools like xdebug in your IDE. In addition, you can get more detailed information with xdebug. Best to make these changes at the .ini file level. Turning on error reporting from within a script is useless, as it won't help with syntax errors or other fatal errors that kill the compile phase. The script gets killed long before it begins executing and reaches the reporting overrides. You are correct indeed. I did not notice that the move is to your own server. Run phpinfo() to find the correct php.ini file. Look for the Loaded Configuration File line. I come here at least once a day copying this..I should probably just memorize it. This answer will fail on php7 when strict typing is enabled, because the second parameter of ini_set is a string. Can it be you just downvoted two people that gave the same advice as you did (see your second code sample)? Did you read my entire answer? I specifically say this won't work for syntax errors, whereas you don't mention that. Putting your code in would make no difference. That's right. I should have thought of mentioning it. so why not error_reporting(-1) ? Wow, I'd tried a ton of ways over the last two hours to change error reporting and this is the one that finally did it -- begone, useless Error 500 screens! THANK YOU. I like the option of .htaccess file. It helps me debug in an area that is not part of the public website. Thanks a lot for this tip! Where is the error log file? In addition to the very many excellent answers above you could also implement the following two functions in your projects. They will catch every non-syntax error before application/script exit. Inside the functions you can do a backtrace and log or render a pleasant 'Site is under maintenance' message to the public. where it will display recent 50 errors. There is a error file error.log for apache2 which logs all the errors. http://todell.com/debug can be useful as well. You can see your object values or thrown debug errors behind the scene even in production mode. You might also want to try PHPStorm as your code editor. It will find many PHP and other syntax errors right as you are typing in the editor. In production, display_errors is usually set to Off (Which is a good thing, because error display in production sites is generally not desirable!). However, in development, it should be set to On, so that errors get displayed. Check! error_reporting (as of PHP 5.3) is set by default to E_ALL & ~E_NOTICE & ~E_STRICT & ~E_DEPRECATED (meaning, everything is shown except for notices, strict standards and deprecation notices). When in doubt, set it to E_ALL to display all the errors. Check! Whoa whoa! No check! I can't change my php.ini! That's a shame. Usually shared hosts do not allow the alteration of their php.ini file, and so, that option is sadly unavailable. But fear not! We have other options! In the desired script, we can alter the php.ini entries in runtime! Meaning, it'll run when the script runs! Sweet! These two lines will do the same effect as altering the php.ini entries as above! Awesome! I still get a blank page/500 error! That means that the script hadn't even run! That usually happens when you have a syntax error! With syntax errors, the script doesn't even get to runtime. It fails at compile time, meaning that it'll use the values in php.ini, which if you hadn't changed, may not allow the display of errors. In addition, PHP by default logs errors. In shared hosting, it may be in a dedicated folder or on the same folder as the offending script. If you have access to php.ini, you can find it under the error_log entry. My usual problem are "little, stupid" parser errors which unfortunately do not show up. if (false==stripos('.php',$sc)) $sc.='.php';  // adjust this if your preferred extension is php5! You are right - this mechanism should not be used for production, it's simply a tool to catch these things while developing/debugging/testing. Turning on error reporting is the correct solution, however it does not seem to take effect in the program that turns it on, but only in subsequently included programs. Thus, I always create a file/program (which I usually call "genwrap.php") which has essentially the same code as the popular solution here (ie. turn on error reporting) and it also then includes the page I actually want to call. to be put at the beginning of the script that is under trouble-shooting. This is not perfect, the perfect variant is that you also enable that in the php.ini and that you log the errors in PHP to catch syntax and startup errors. The settings outlined here display all errors, notices and warnings, including strict ones, regardless which PHP version. Install Xdebug and enable remote-debugging with your IDE. 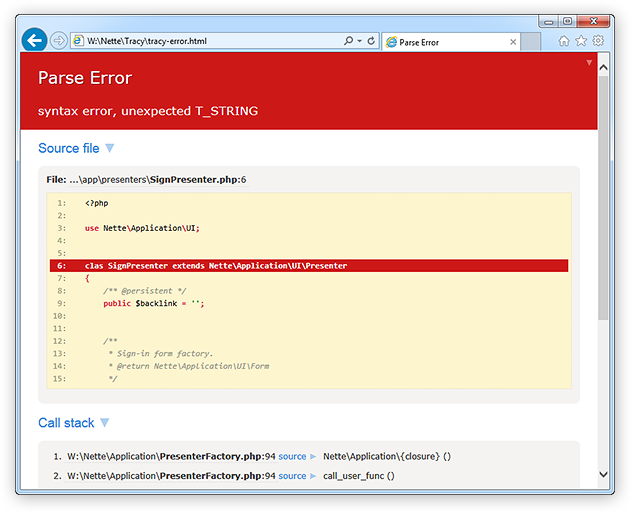 Try this PHP error reporting reference tool. It's a very good visual reference and helped me understand the complex error reporting mechanism. This will only display errors when you are running locally. It also gives you the test_server variable to use in other places where appropriate. Any errors that happen before the script runs won't be caught, but for 99% of errors that I make, that's not an issue. This is what i looking for ! :), Why no one give it upvote ? Debuging a website is only neeeded by webmaster and not client. So run it locally is the best for security. If you're differentiating between local and production environments, you should simply enable or disable errors globally (in your php.ini) and not in code that can also be production code. If you need to debug a production website in its production environment and only want you to be able to view the errors, use $_SERVER['REMOTE_HOST'] to check whether the client is, well, you. Will force the display of errors. This should be turned off in production servers, but not when you're developing. As with Tomalak's answer, this doesn't work for syntax errors. FirePHP can be useful as well. You can enable full error reporting (including notices and strict messages). Some people find this too verbose, but it's worth a try. Set error_reporting to E_ALL | E_STRICT in your php.ini. E_STRICT will notify you about deprecated functions and give you recommendations about the best methods to do certain tasks. There is a really useful extension called "xdebug" that will make your reports much nicer as well. Indeed, this is a very useful debugging tool—makes error messages much more verbose, with full stack traces and variable dumps and everything. Yes. And then use something like the VimDebugger plugin to step through your code and find out where it goes wrong. +1 I use eclipse with xdebug for full step over/step into debugging. Makes PHP development sane! NetBeans with xdebug here. It's so awesome. I'm new to PHP (usually ASP.NET) and had been issuing echo statements before. This overrides the default settings in php.ini, which just make PHP report the errors to the log. This doesn't work for syntax errors as Candidasa mentioned. That's true. In this case the values must be set in the ini directly -- for a pure development environment this may be preferable anyway. Yes, but that is already covered in all other answers. [SOLVED] How to debug in Django, the good way?